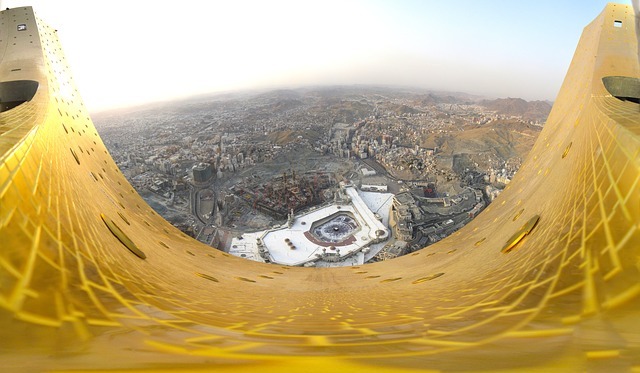 Moun Arafat (Jabal al-Rahmah), or also known as Mountain of Mercy, is a granite hill which is sixty meters high and it is located east of Mecca. Why is it important for Islam? Because it was from it that Muhammad gave his farewell speech, at the end of his life, for all those muslims that had been with him during his Hajj pilgrimage. What Happens at Mount Arafat? The plain of Arafat, which consists of the surroundings of Mount Arafat, it is the place where Hajj pilgrims spend the afternoon of the ninth day of Dhu al-Hijjah. So important is being here that those who are not lose the validity of the pilgrimage and have to do it again from the start, as if they had never done it before. Pilgrims stay awake during the night here. According to muslim beliefs, Adam and Even were forgotten by Allah at Mount Arafat. In these days, ‘Friday speech’ or Khutba, is given from this hill. On the other hand, the unforgettable Palestinian leader Yasir Arafat, obtained his name in honor of this mount. Every year, millions of pilgrims go to Mount Arafat on the ninth day of their Hajj pilgrimage. It was from them that we have obtained the most sensitive testimonies of faith and abnegation that are worth sharing with the rest of humanity. We have the moving case of Taofik Odunewu, a Nigerian who, while his country was suffering the devastating attacks from the the terrorist group of the jihadists, he claimed to feel as free of sin and clean as a newborn. Immediately after saying this, he assured to pray for prosperity and for his country. The millions of pilgrims marching towards Mount Arafat repeated at the same time: ‘Here I am, oh Allah!’, leaving testimony of the faith and devotion they make use of at this common instance that it is Hajj, major pilgrimage which is mandatory at least once in a lifetime for each muslim. All the extremes are lived when reaching Mount Arafat; from the most tired ones, who lay on mats, to the ones who rush to reach the sixty-meter top from which the plain can be beheld. In order to have an organized pilgrimage and to avoid that the fanaticism of some faithful do not affect the good performance of others, 85,000 segurity agents have been provided to ensure that the crowd march organizedly and showing respect towards the others. Such soldiers are in charge of making the crowd circulate and they make sure that no one obstructs the way of those who come after them. They control that the path is free to walk in and, if necessary, they also banned those who have come to the pilgrimage without the required permissions, which is a mandatory requirement in Saudi Arabia. Finally, the authorities have arranged health measures to avoid contagion of two viruses that have been attacking Saudi Arabia lately: ebola and MERS coronavirus.